I’ve spent a good amount of time this morning working on my schedule for all of the NXNE events happening this week. Adding to the official schedule of bands performing, there’s a variety of parties,impromptushowcases and outdoor parties worth looking into. Most will be covered when I post my picks for the festival. This one deserved its own post. 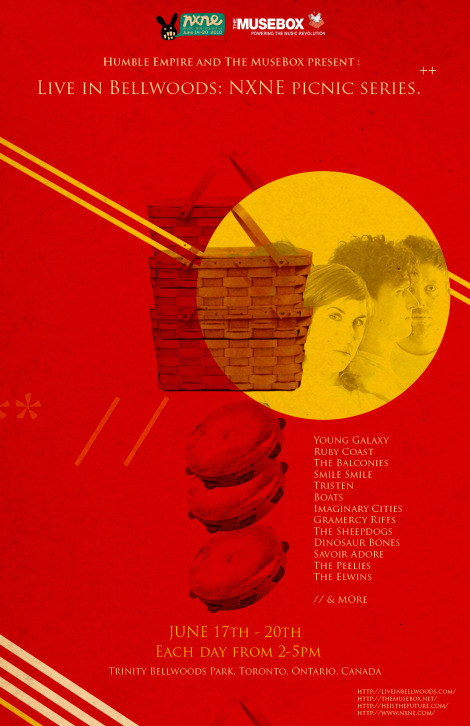 Humble Empire and The MuseBox are pleased to present to you the first ever Live In Bellwoods: The NXNE Picnic Series. Four days of stripped down acoustic afternoon showcases in the lovely Trinity Bellwoods Park, from 2pm-5pm each day (this thurs to sun). And its free. BYOWhatever you’d like, here’s the basic schedule.